A good visual for the choppy market action we have experienced of late, with bulls and bears alternating "ah hah!" 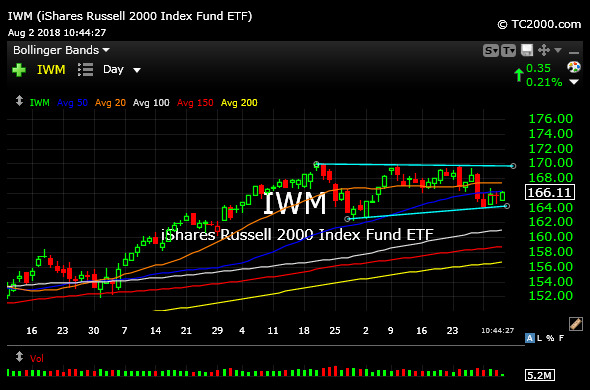 moments where they think they have the opposition cornered only to find themselves in a tough spot, is the IWM ETF daily chart, below. Those pesky small caps finally cooled off after a brilliant May/June run, but have not sold off as steeply as bears would have wanted to see, at least not yet. Instead, we have a well-defined sideways channel, highlighted in light blue, which is rather typical of August trading in the stock market. Should we see this channel breached, it would be a noteworthy development indeed. But for now the small caps are telling us to remain light and tight in terms of swing trading exposure. Elsewhere, TSLA and SQ are reacting strongly to earnings. So even as the Dow remains down triple-digits as I write this, tech names are attempting to tilt a slight edge back to bulls within the channel range as they outperform this morning.